People who love pets, and fans of Sonoma County artist Mylette Welch’s whimsical animal paintings, both have a reason to go see her new “Gimme Shelter” exhibit, opening today (Tuesday, July 5) at the Graton Gallery. 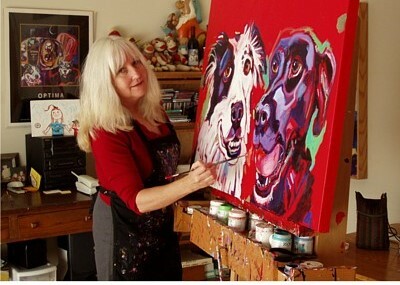 Welch subtitles her show “Paintings of Shelter Dogs and Cats Who Dream of a Forever Home,” and it runs through Aug. 19 at the gallery, at 9048 Graton Road in Graton. The opening reception runs from 3 to 6 p.m. Saturday, July 9. Gallery hours are 10:30 a.m. to 6 p.m. daily except open Mondays.